Apparently my blog is 4 years old! As I've done in the past, I want to share recipes for my favorite cakes for my blog's belated birthday. 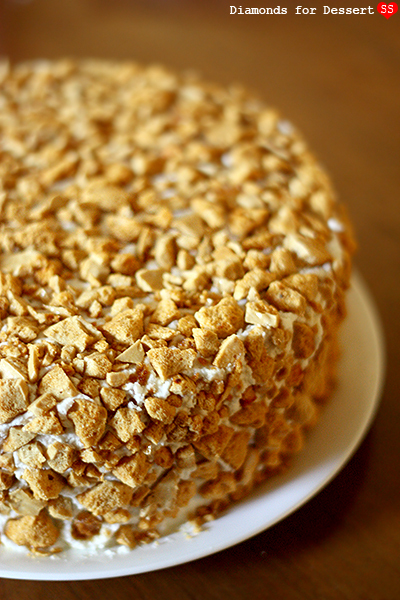 Today, I'll be sharing a new favorite of mine: the Coffee Crunch Cake. This summer, I was back home in California doing research in SF, a city near and dear to my heart. Throughout the summer, I spent my time after work and on the weekends exploring the city: the bakeries (duh! ), restaurants, ice cream shops, food trucks, bars, art museums, shopping, etc. I discovered a tiny bakery in Japantown that's known for Coffee Crunch Cake, something I never heard of before, but with all the good review on Yelp, I decided to take a risk and get it. Well, it was delicious! Naturally, I decided that I needed to make one at home from scratch. By the way, just fyi, back in the day (in the 60s), there used to be a pastry shop/candy store/soda fountain in SF called Blum's which was where this cake was created. The shop is no longer open, but the cake is still made at a few select bakeries in CA, and, of course, you can make it at home :)! I like to call it "the Thing" cake (you know, Fantastic Four). It's not the most attractive cake (I do think it's eye catching though), but it tastes amazing. Like a creme brûlée flavored cake! 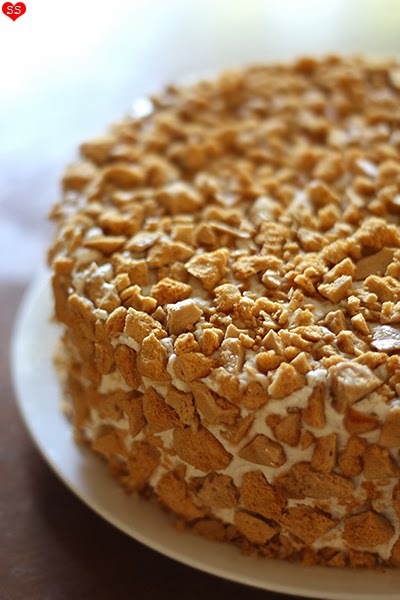 It's made of a few layers of fluffy chiffon cake alternating with plenty of freshly whipped cream and covered with lots of yummy honeycomb candy AKA coffee crunch. 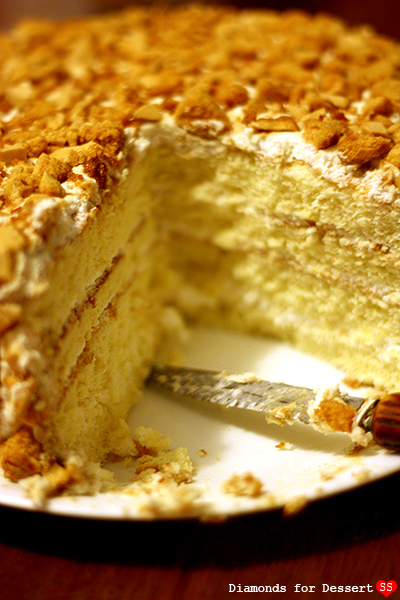 For me, the best time to serve this cake is a few hours after decorating, after it has chilled it in the fridge; at this point, the coffee crunch has had time to melt into the whipped cream, yet it still retains its crunch. Yum!